2.0sqm 150watt per sqm heating mat for concrete floors 0.5m wide and 4m long. DEVIcomfort for Concrete Floors is a thin heating mat specifically designed to be installed within a tile adhesive layer. It evenly warms the floor surface eliminating the cold chill associated with hard floor surfaces. It is ideal for tiles on a concrete floor or parquet on concrete, and can be installed beneath other surfaces such as laminated floors and vinyl. 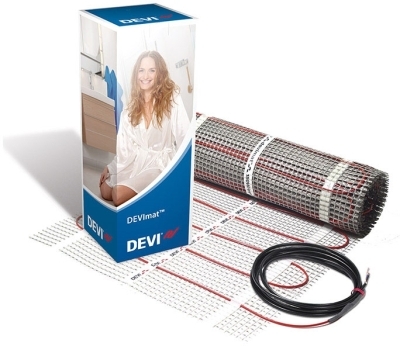 DEVIcomfort is a prefabricated, self adhesive mat with a thin heating cable ready mounted, all within 3mm thickness. It is an open mesh design allowing the tile adhesive to bond to an existing floor. The mats are available in a range of sizes from 1-12 square metres. Each mat is 0.5 metres wide. For example, a 5 square metre mat is 0.5m wide and 10m long. The heat output of this product can be regulated using a controller. Generally only one controller is needed for this product, however, for larger areas, one controller per 23m2 should be used. There is a choice of wall mounted thermostats, with the most popular being the Devireg Touch. 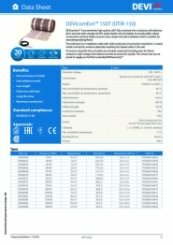 I fit wet rooms and have used your company to purchase heat mats for the last six or seven they have all been delivered on time with not a single problem. Thank you very much for your wonderful comments, your review is very much appreciated and we look forward to working with you again! Typical wiring layout for connection of DEVImat to 540/550 DEVIreg controller.